I love make-ahead breakfasts! They make it so easy to grab-and-go in the morning. 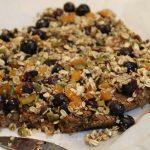 This oatmeal almond breakfast bar recipe is so good! They help keep you full until your next meal thanks to the fats from the almonds and fiber from the oatmeal. You can make this breakfast bar recipe ahead of time and save them for the whole week. These aren’t just good for breakfast! They make a great midday snack, too. Try these out. They’re perfect for those busy weekday mornings. This breakfast bar recipe is perfect for those busy mornings. You can make this ahead of time and save for the whole week! Your kids will love it. Using a heavy duty food processor or blender, combine all the dry ingredients first and then add in the wet while still processing. This could take a bit. Pour combined mixture into the bottom of the pan and spread evenly. In a medium bowl, combine all the ingredients. Spread mixture out evenly on top of the baked base and press down. Bake another 15 minutes. Enjoy!